Unlike Astro Boy, A Trip to the Moon has no real “storyline” to carry the audience through, the moon itself being the only constant. A recreation of the 1902 Georges Méliès silent film about space travelers to the moon is shuffled up with two other stories – the folk tale of a bamboo cutter and his adopted moon princess daughter, and the Russian space dog Laika. The silent film sequences are visually stunning, providing for the gorgeously quirky illustrations and live drawing now a hallmark of Onoda Power’s style. However, its narration and music overlap to the detriment of understanding the narration, a technical issue that adds to a sense of alienation which may be intentional – if not, it’s an easy fix. As a framework, switching between the silent film and the other two stories is jarring, and it takes a bit to relinquish the desire for a conventional plot line. The marriage of Onoda Power and Synetic meshes more significantly as the play progresses, and begins to result in chillingly simple moments, as when an aristocratic visitor from the moon stops action merely with a flat palm. It culminates with an extraordinary sequence telling the story of Russian space dog Laika: from her hard life on the streets, to dreams about her lunar parents, to her sad fate orbiting the earth. That all sounds absurd, and it is, but that absurdity is also the genius of combining Onoda Power with choreographer Irina Tsikurishvili. Witness the moon dog pas de deux, danced by Francesca Jandasek and Ben Arden as both incredibly silly and yet beautifully passionate. Add in the emotional commitment of Karen O’Connell’s Laika, especially in the harrowing process of becoming the chosen space dog against Jared Mezzocchi’s terrifying projections. Frame it with the sweet yet funny bedtime story narration of mother to child, and you have a theatrical sequence that’s profoundly visceral. The role of Mezzocchi’s projection art in making this improbable play a success cannot be underestimated, nor can the lighting design of Andrew F. Griffin. As always, the challenge of this particular theatrical space at Crystal City is difficult to overcome. It’s cavernous, but Griffin solves that problem with lighting that spreads out of the conventional space – flashing into the audience’s eyes like a rave concert in some moments, sparkling like stars across the walls at another. They both help create a seductive dream environment. Onoda Power is pushing the boundaries of what we expect from theater, and Synetic strives to do the same. Both are also wryly acknowledging the challenges of doing so. For me, that’s exciting to witness. I’d rather see companies reach for the moon and fall, than not reach at all. 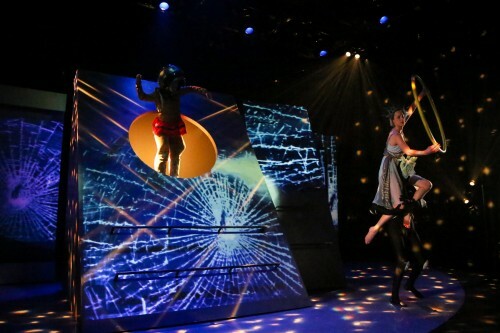 Synetic Theater‘s production of A Trip to the Moon performs through January 6th. Located at 1800 S. Bell Street, Arlington, VA 22202. Closest Metro stop: Crystal City (Yellow/Blue lines). For more information call 800-494-8497.